Congratulations Jude300. I'm taking delivery of the bike today. I see your registration plate start with TN. So where did you buy the bike? Chennai? Yes, The decision to own this bike should be based on whether one can live with the cons and not just the positives. Please do share a few photos of the front guard if you are buying them. I am sorry to have put that so early. I went to have it fixed this week and only then came to know that The crash guards were custom made by the dealer. And due to some design change in bikes of the new lot it does not fit. Not sure what changed or whether it was just an excuse for non availability. Thanks for the wishes Ram. Yes I am from chennai. Best wishes for your bike. It's raining Himalayans now on TBHP. You mentioned of engine clatter. Is the engine clatter more or less than the TB500 & CL350? I might not be the best to give a honest comparison as I have not owned both. 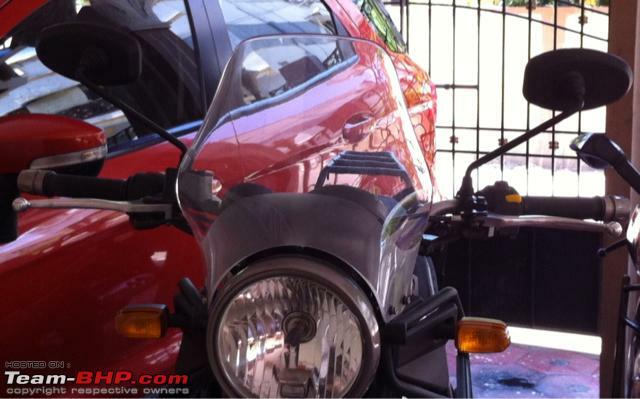 However, I rode the CL500 before booking the Himalayan and that was a poorly maintained rented bike. The clatter in the new Himalayan is almost close to the clatter in that CL500. The disappointment is that a newly built engine with some advancements from the earlier generation engine is still not void of the noisy clatter. When the temperature peaks the clatter gets worse and with helmet on you can't even hear the exhaust but just the clatter. A cold engine sounds much better. However, hoping things change for better after the first service as many have reported. Last edited by Jude300 : 10th June 2016 at 08:25. I am sorry to have put that so early. The Engine clatter is on the higher side when compared to my old TB500. The disappointment is that a newly built engine with some advancements from the earlier generation engine is still not void of the noisy clatter. Its a big single and you can expect it to have some sort of engine clatter. This is due to the tolerance/clearance that needs to be factored in for the engine to perform without seizing. Yes the engine clatter somehow reduces post the first service but after a long journey you can still hear to it. It should not be a matter of concern as long as there is no power loss and remember those HD & Duc...they do have much noisier engines unlike their Japs counterparts. However the Yamaha R1 Engine from 2003 to 2008 had those 5 valves per cylinder which were also a tad noisy. So I guess one has to live with the engine clatter. Took Delivery of my RE Himalayan Snow White yesterday. It's a awesome experience driving back to home from the showroom. Will post a separate thread on the ownership experience. Arulpeem sir and yours are very useful reviews. My busy work schedule has been keeping me away from my bike and sob it's really painful. Have covered only around 370 Kms and it has been a pleasant riding experience so far. Today i was inspecting the bike for any loose nuts or bolts and observed that the second bolt was loose. Tightened it now. There were no other loose bolts or screws. One day the temperature reading was as high as 48 degrees while the weather wasn't that hot. Is this something noticed in other Himalayans as well? Owners please shed some light here. Normally it stays around 46 and at nights around 43/44. Last edited by Jude300 : 16th June 2016 at 22:15. 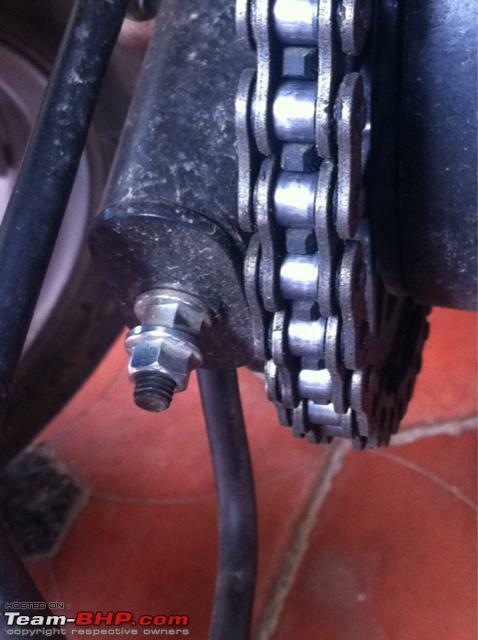 You should check the temperature only when the bike is cooled down and not started. Then you would get realistic temperature readings otherwise the engine heat will foul up things. The same is also mentioned in the owner's manual - "Refer to ambient temperature indication only when the vehicle is stationary and engine is switched off." Last edited by dkaile : 16th June 2016 at 22:59. I have been super busy at work and have not really been able to enjoy the rides with Bagheera. Last Friday I got a call from the RE TSM that my bike has been recalled to fix a faulty rocker unit (oops I forgot what exactly was the name) which was responsible for the tappet noise. Since I had clocked 450km I opted to do the first service too. - trashy engine noise has now significantly reduced and is now more mashy. It feels smoother and does not sound coarse. 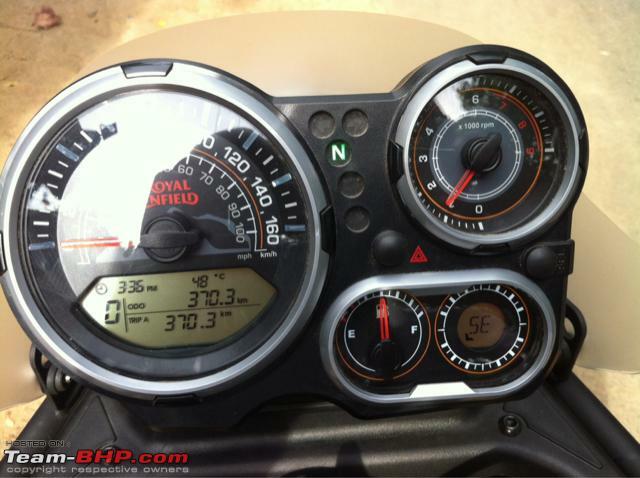 - the bike used to reach 60kmph @ 3100rpm earlier. Now it reaches 60kmph a little under 3000rpm. - to be shifted to 5th gear only after reaching 60kmph. Shifting to 5th gear before 50kmph lugs the engine a bit. - gears shifts have not changed. Still hard shifts 1 - 2 gears. They didn't recommend changing to CL350 clutch cable sighting that the one on the Himalayan is a lot more durable. Will evaluate changing it after observing any change in gear shift with more use. If it does not get better, will change the cable. 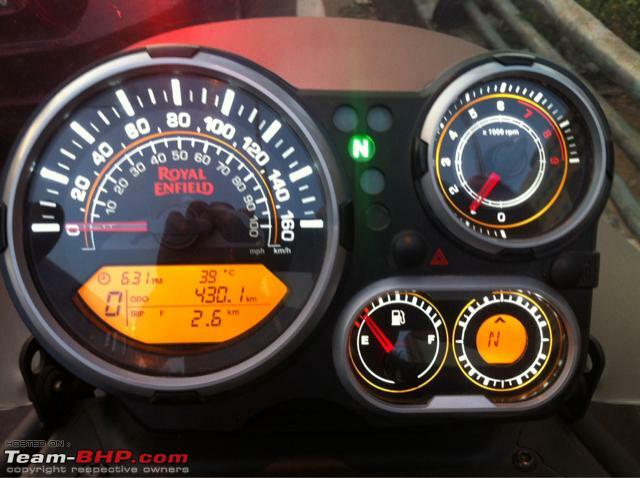 - I had complained of the sudden decrease in the fuel indicator post half mark. They have checked that but I need to check if they have really worked on it. - I adjusted the windshield to a more upright position and the wind blast hitting my face has reduced. However, it seems like it's causing more wind resistance. 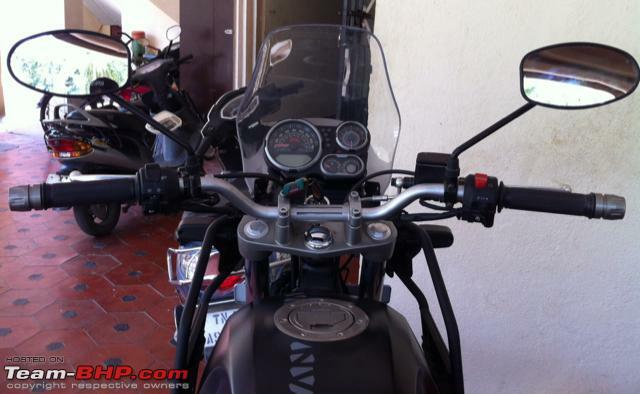 - drove the bike @ 80kmph post the first service and it reaches the speed effortlessly and is very stable. - the RE guys were very courteous in the service. Offered free door pick up and delivery. Attached below is the service invoice. The Rs. 150 consumable charged is petrol added to check the fuel indicator. HP RACER 4 Plus 15w50 must be better than liquid gun (motul) because of longer change intervals! Shouldn't all RE engines use this as cost is similar to liquid gun? 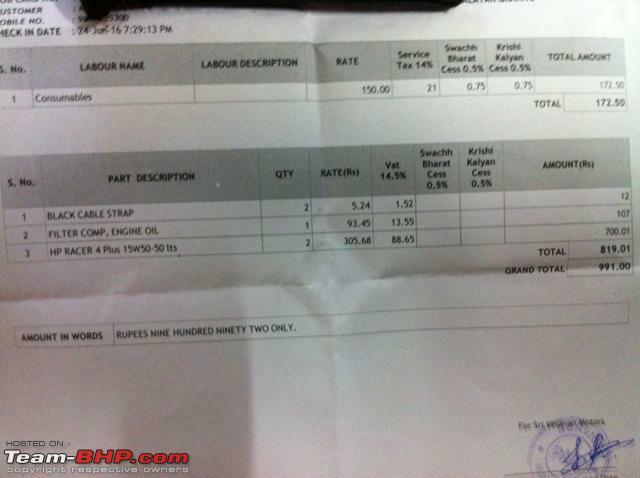 I'm confused, same spec, same price engine oil (HP) has a longer change interval. Is the LS410 engine so efficient over its UCE mates? RE no longer uses Motul. The regular one and Himalayan specific both are manufactured by HP. I would prefer using Motul any day the best I would say w.r.t cost and performance would be the 5100 semi synthetic. I am still doubtful how will the oil fare till 10k. Just back from a 90km impromptu ride. The bike has really changed after the first service and it's getting better each day. At 80kmph it was rock steady. Did 100kmph for about 4 to 5 km only and still very steady. However, the resistance of windshield can be felt when you go against the wind. I think it will be less evident with luggage or pillion. 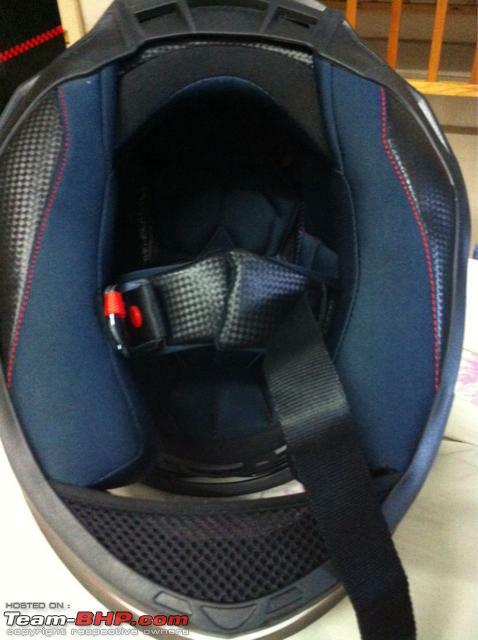 Without pillion / luggage the stiff rear suspension is also evident. Overall, I am mighty satisfied. There were quite a few giving the curious stares from passing cars. 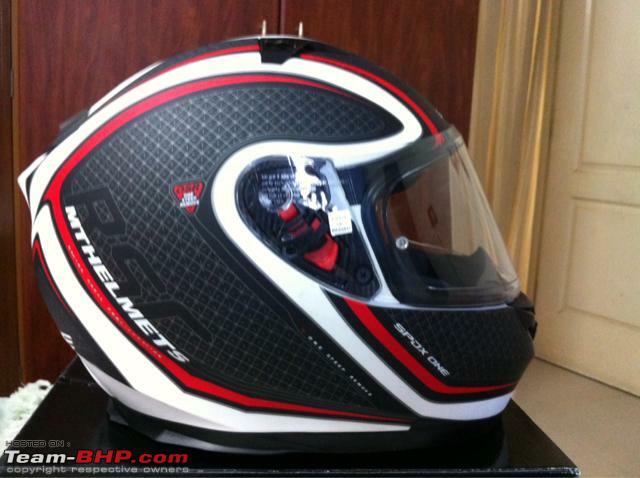 I just bought my MT Blade helmet and used it for the ride. 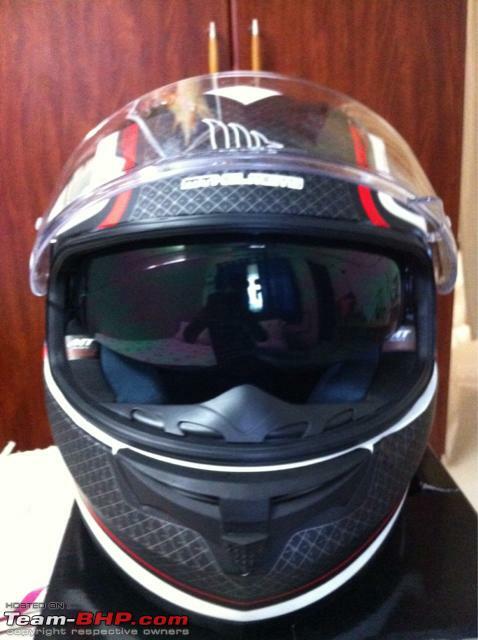 It's a good helmet and the dual visor is good. The only issue I felt was the ventilation. My head didn't sweat but my face did. I could not feel any air coming to my face. May be because it was a sunny afternoon. Or may be because it was just new and it was fitting tightly. Will update on that a well. Taking cues from arulpeem and Dheeraj'ji (dkaile) I changed my rear view mirrors to that of the GT. Tried TB's mirror as well but the GT mirror was more stylish so went for it and the view is almost the same. It costed Rs. 497/- including labour. As usual RE guys didn't have it tightened properly and there was a bit of vibration. Came home and tightened the 3 star screws behind the mirror and it's now perfect. The field of view is really good. Makes a world of difference compared to the stock mirrors. Last edited by Jude300 : 26th July 2016 at 12:10. As usual RE guys didn't have it tightened properly and there was a bit of vibration. Came home and tightened the 3 star screws behind the mirror and it's now perfect. Last edited by dkaile : 26th July 2016 at 12:20. I've switched to the mirrors of the new Avenger and they make a HUGE difference. They become wider towards the outer side and are in general much larger. More importantly inspite of being squarish, they suit the bike very well, aesthetically. Total cost somewhere around 450 for a pair.